Diggers Valley: 18 August 2012. The week beginning the 18th of August 2012. I felt the season's first calf movement today, inside Ranu 31. We're off on our holiday at last, this week. 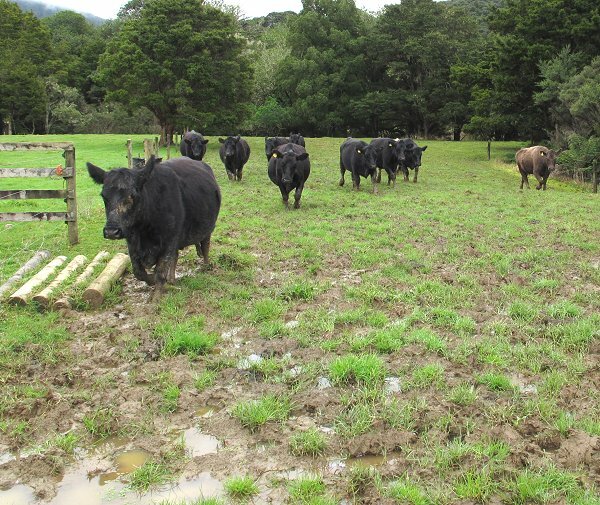 What a holiday means though, is weeks of planning ahead, which has consumed my time and thoughts; primarily so that the cattle will be in easy-to-check and move paddocks, for our very kind farm-checkers, Gaye and Brian. There are no catteries nearby and with an incontinent elderly Foxton and Finan who won't stay in the house with anyone but us, there have been some other planning issues as well. I moved the cows this morning, from the Camp paddock so I could both check them and also apply some tail-paint to those without tags, in case Brian needed to identify those individuals in my absence. The cows didn't like the hiss of the spray can though, so only Demelza (who will stand still for anything, whether I want her to move or not) got an easily recognisable number on her shoulder. I wanted to paint them where they couldn't easily lick it off, but had to settle for some back-of-the-legs marks for Ranu 31, Imagen 33 and 488. The wet ground here is indicative of the amount of rain we've had. It is an area where I'd like to do something about the drainage, being a gateway. 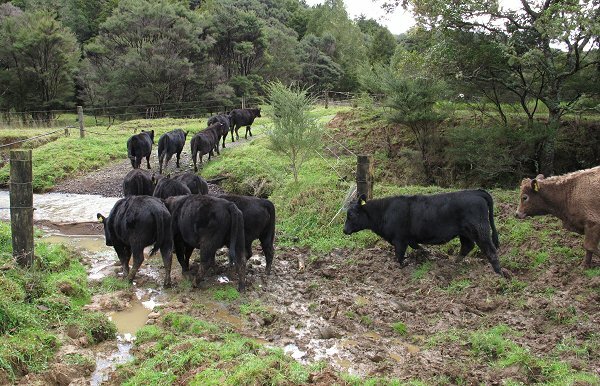 Zella led the heifers out of the Bush Flat Paddock, after I'd gone around the paddock to encourage them to come with me. Gaye and Brian came out for lunch and final instructions. There isn't much that can go wrong, barring serious accidents with cows in holes, but in this last trimester of their pregnancies, I like to keep a reasonably close eye on things. And because we're going away during the last week of August, always the worst time of the year on the farm for feed and ground conditions, the cows need moving every couple of days. While Brian tells me he and I do things rather differently, I am confident he would spot anything wrong and know what best to do. I spent most of my day thrashing out an article for NZ Lifestyle Block Magazine. I'd already mostly written it, but my creative process requires sitting back from such things for a while before going back to the job with fresh eyes. In the afternoon I brought Zella and the heifers to the yards for their second winter Copper injection. I figured I could leave them a bit later than the others, since Zella is calving last in the herd, but if I left them until after our holiday, Zella wouldn't have time for a third shot before calving. We would much prefer to have shorn the sheep before we go, but since Stephan's arm recovered, there hasn't been enough good weather to dry their wool properly. We dug out the fly-strike powder and have asked Brian to keep a close eye on them. 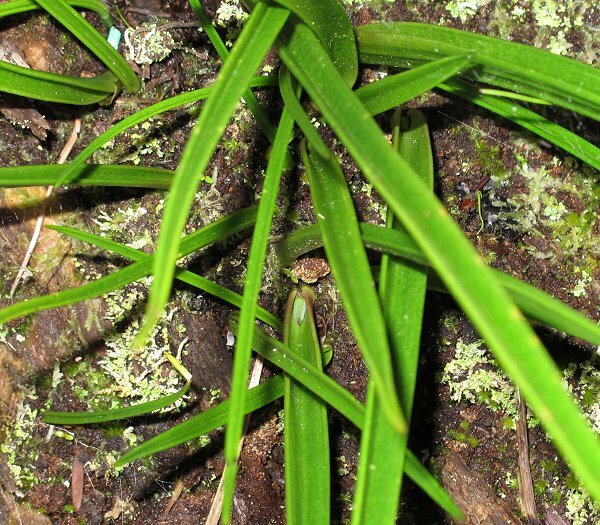 These are the orchid plants on the fallen Puriri, just beginning to develop their flower spikes - there's one visible in this picture. I like to record this stage each year, in an attempt to find out what it is, climatically, which prompts their development through their annual growth. I've erected electric tape around a couple of areas in the Mushroom 3 and Bush Flat paddocks where I found plants last year and they're growing bigger leaves than I've previously seen there. Finding one large plant too far outside the tape to be enclosed, I transplanted it today. I'll watch and see how it grows in its new position a few feet further up the slope. I've brought quite enough of them into my greenhouse sanctuary and there was safety where I replanted it. I took my trough-sucking hose around to the troughs where the bulls will be grazing while we're away, to remove the muck and dead leaves from the water and while siphoning the one at the bottom end of Flat 2, noticed how many Cabbage Trees have grown in the little reserve area there. 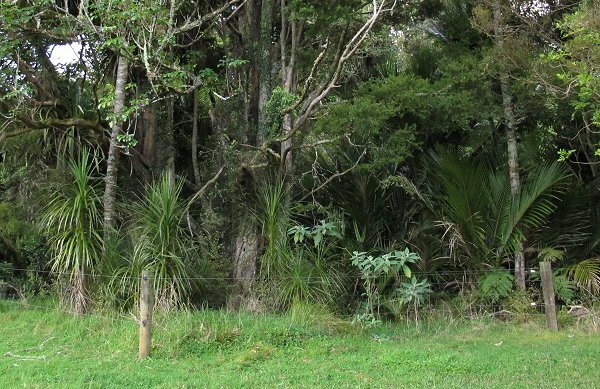 Those light grey-green leaves are the widespread Tobacco Weed/Woolly Nightshade, which are spread all around Northland by Pigeons eating their fruit. We'll have to cut them out sometime. Early this morning we set off. Jane took us up to the airport and our plane left on time, so we made it to Auckland in time to catch our direct flight to Queenstown. Air NZ had changed some of the flights I'd originally booked, and a very helpful woman on their telephone help line managed to put us on the direct flight rather than going via Christchurch, which meant we arrived three hours earlier than we were expecting to on the original booking. 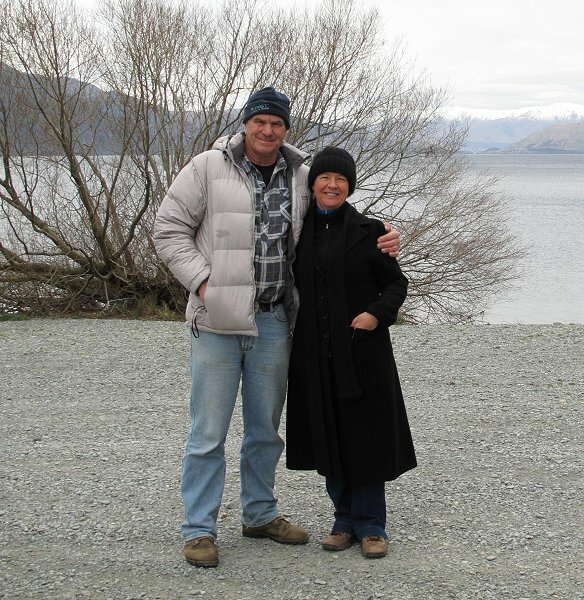 We chose Queenstown because neither of us has ever been there and Stephan's cousin Doug, Kathleen and their three children live a few kilometres out of town and were keen for us to visit. 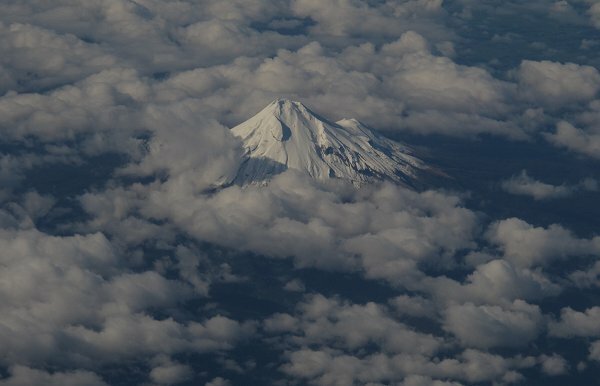 The line from Auckland (orange) to Queenstown (blue) took us past Taranaki (green), which I always enjoy seeing. 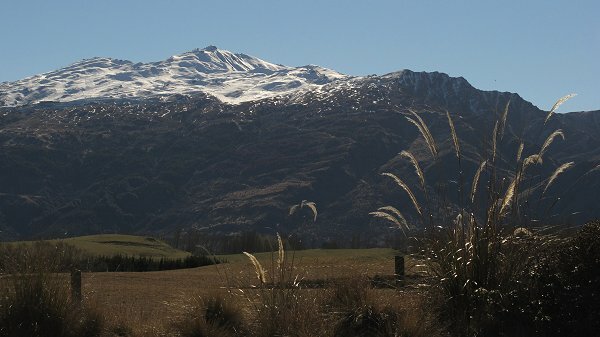 The landscape in the South Island is fantastic, its landforms so different from those where we live. The evidence of its glacial history is everywhere. 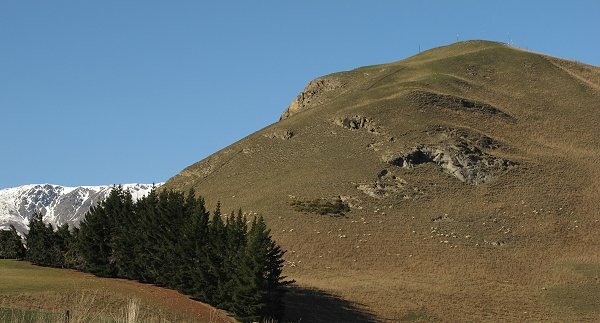 The Te Ara website has some interesting information about the area. There was an awful lot of snow everywhere and it looked bleak and uninviting for two people accustomed to being out and about in the hills without fear of freezing to death. 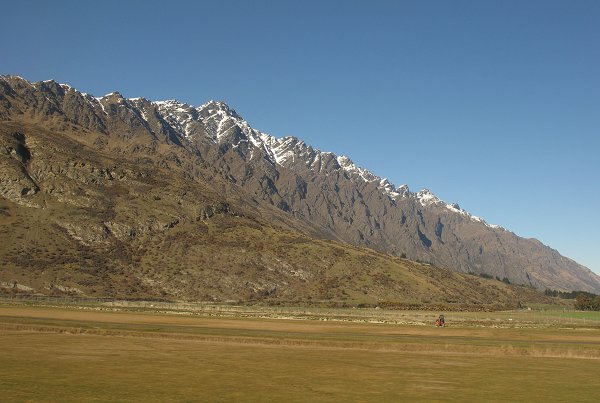 We descended the stairs from the rear of the 737 into a clear sunny day, facing the remarkable Remarkables mountain range capped in snow. The air was excitingly frigid! The colours were amazing, from the orangey tussock on the higher land to the darker brown of Matagouri lower down, with flowering gorse amongst it in places. There was green, but not a green I'm used to in the land of Kikuyu, winter grass growth and sub-tropical rain-forest. Kathleen picked us up from the airport and took us home. 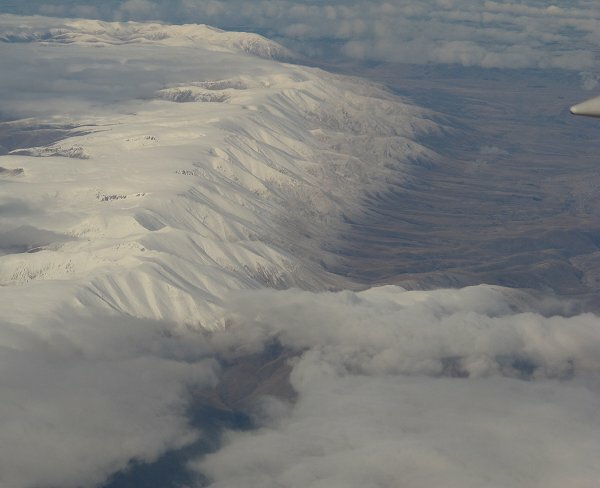 One of the splendid views from their living room was of the ski-field on Coronet Peak, where we could see (through binoculars) people skiing down the slopes and travelling up on the chair lifts. 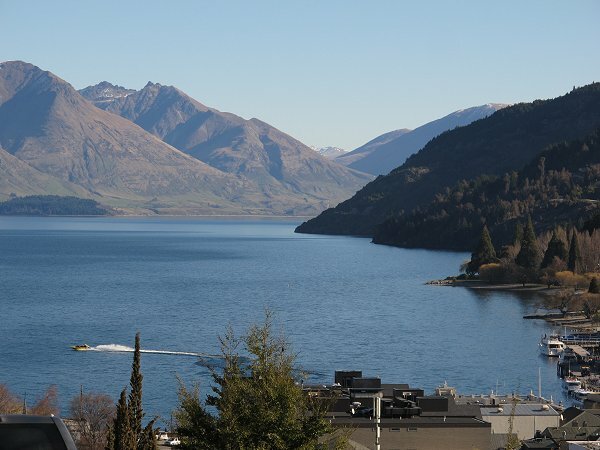 We went with Kathleen to pick up the children from school in town, via a high point to see our first view of Lake Wakatipu. It took me some time to get my bearings and realise that the waters enter the lake from the far distance, around the corner in the picture, to the North (and numerous other tributaries from the slopes around the lake) and exit not at the other end, but back behind us via the small arm of the lake down which we'd just travelled (in the picture above). 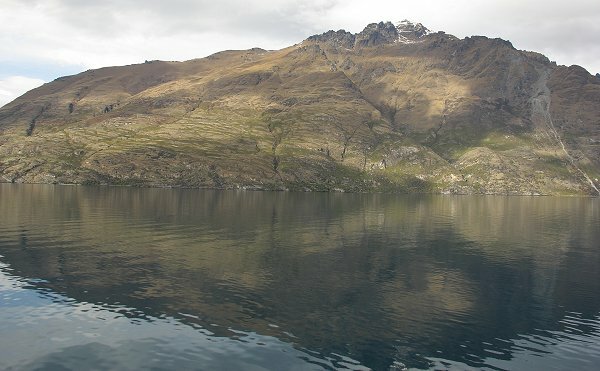 While writing this, I've become disoriented again: the lake has a zig-zag shape and in my mind I have it the wrong way up with reference to its North-South orientation. Down at the lake-front we walked with Kathleen and Tomas, through the throngs of tourists. The steamer, Earnslaw, was returning from its trip across the lake and I saw the steam from a blast of its whistle a good second before I heard it. What a remarkably picturesque place. The steamer did a loop around the bay and came in to dock, to unload its cargo of tourists. 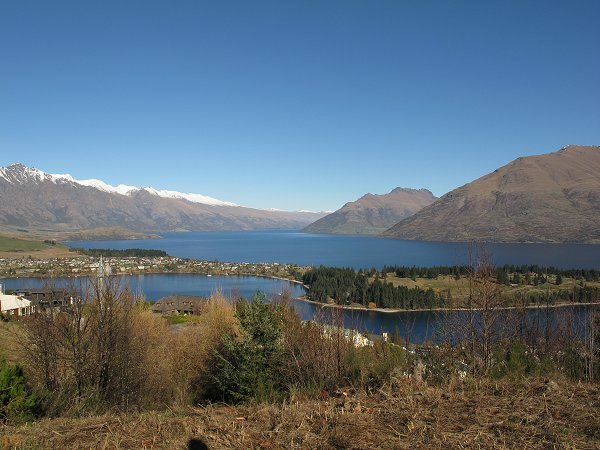 The thing which immediately struck me about Queenstown, was the marked lack of Kiwis anywhere around the main tourism area. 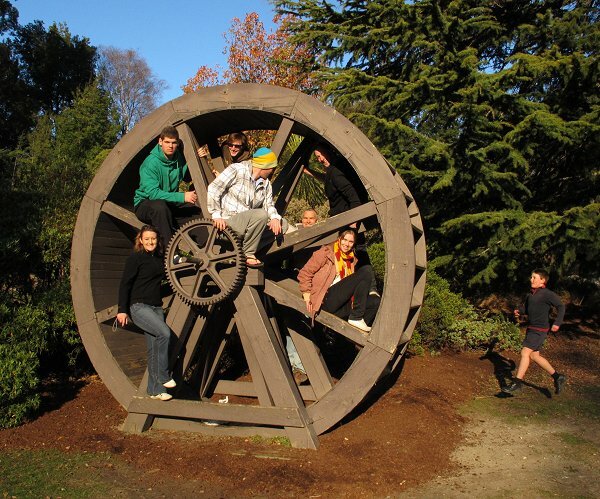 There was the odd one, as we later discovered, but most of the workers were young people from Europe or Asia. The other thing which happened several times was our being asked by people to hold their cameras and take their pictures. Try that in the Far North and you will probably need to buy a new camera! This lot were from Australia and after they'd had their proper picture taken, I took another one - there are a couple of extras in the background. 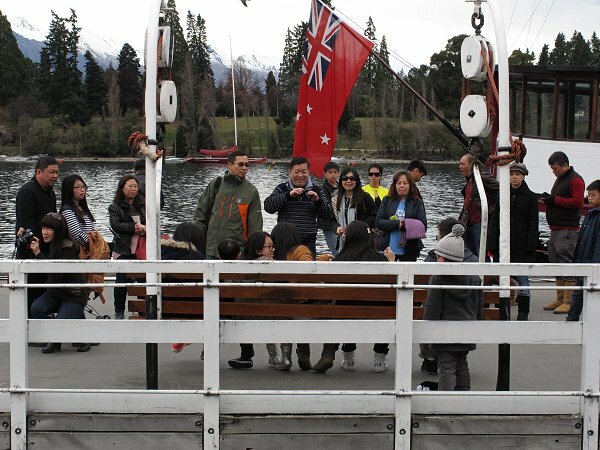 The visiting population seemed to be primarily camera-toting travellers of various Asian origins and skiers from Australia. 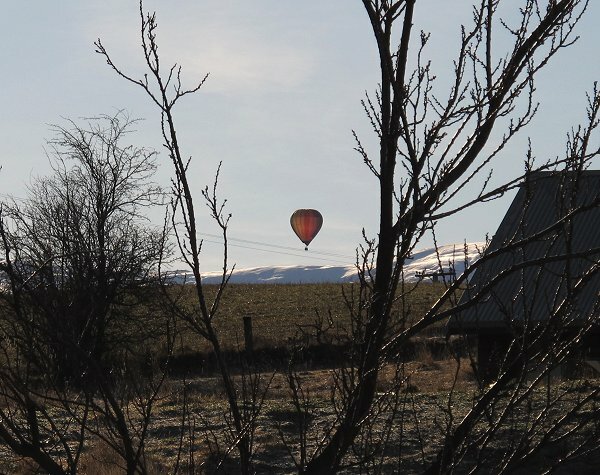 In an adventure paradise, nobody bats an eyelid at passing hot-air balloons before breakfast. This is Slope Hill visible in the other direction from our hosts' living room windows. Farming happens in an entirely different way down here. The white dots are sheep and the green tinge is what passes for grass for them to eat. This is my favourite photo from the whole trip. 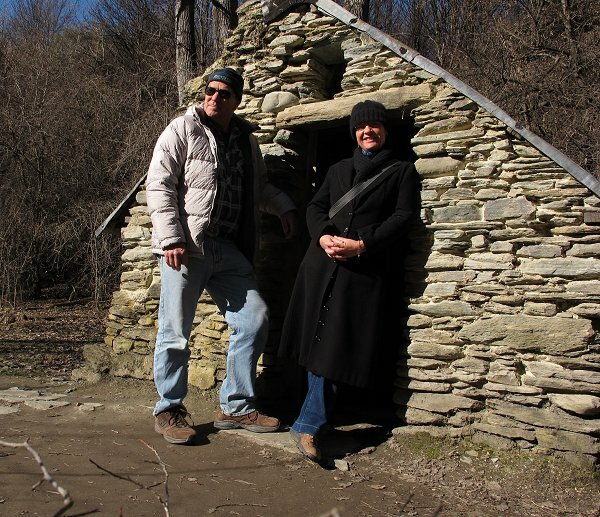 Doug had delayed selling his old ute for our visit, so we'd have a vehicle to travel around in, and we set off this morning for a visit to Arrowtown, a town built around the discovery of gold in the 1860s. We were both really tired, so a short outing was all we required today. On the way along the road I spotted this wonderful little lake with its extraordinary plants. We went for a quiet wander around the historic mining settlement, created by the Chinese who came to extract the gold from the Arrow river, which has been partially restored with the tiny huts reinstated to their original state, as shown by a number of early photographs mounted around the area. The little huts were of various shapes and sizes, all built from the Schist (stone) which is everywhere in this area. Everything is built from it, from houses to garden surrounds. It must have been a bitter existence, living here in these tiny shelters in the winter! Gold is a serious god. 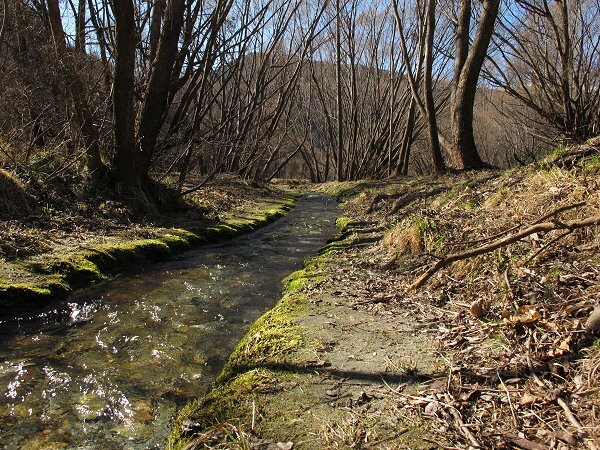 A lovely clear and fast-running stream - it's in the Bush Creek Reserve, so perhaps it is Bush Creek? I wonder what it looked like before all these Willow trees grew along it? It must join the Arrow River a little further on. Tired out by our holiday - actually probably collapsing in the vacuum of having few responsibilities - we had a "nanna nap" in the afternoon, after which I felt a little more able to cope with life and interacting with people. 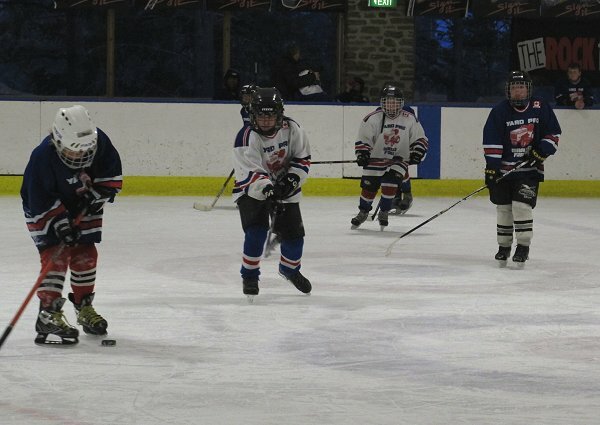 In the early evening Stephan went with Doug and Tomas to watch Tomas's game of Ice-hockey at the rink down at the Queenstown Gardens. Kathleen and I dropped in to have a look on our way to pick up Olivia from Gymnastics. It was surprising, on leaving the ice-rink building, to feel that the air was relatively warm! Warmth wasn't something we had experienced yet in Queenstown, except in the home of our hosts. 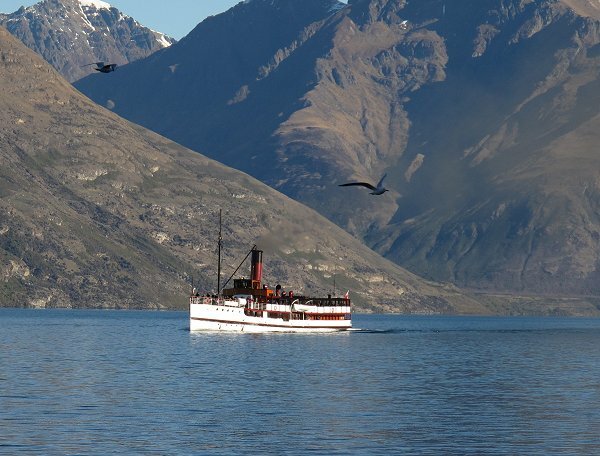 We drove down to the town and walked around to the wharf and purchased tickets to board the steamer Earnslaw, which has travelled Lake Wakatipu since 1912. 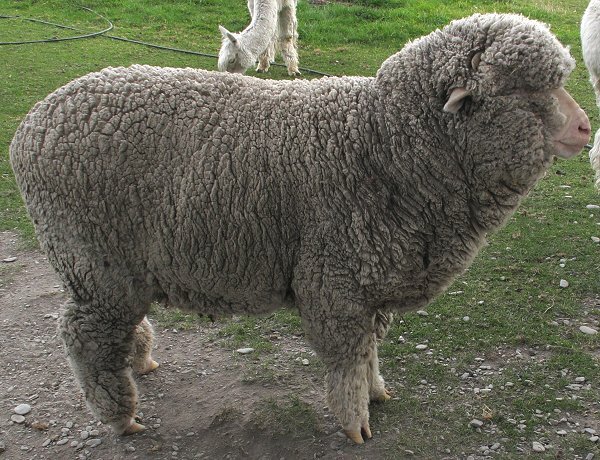 There were photos on the lower deck showing some of its earlier passengers, many of which grew their own wool, rather than having to put it on daily. The Earnslaw was once the only practicable transport to the farming stations on the other side of the lake. There are roads out from them, but they're not easy routes and require the travelling of many miles to get around the mountains behind the stations. 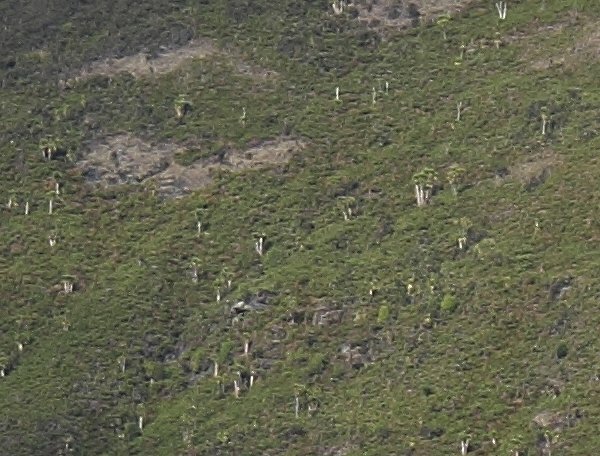 In one of the green patches, there were mature Cabbage Trees, which we could barely see without binoculars (which we had the foresight to take with us), indicating how huge the whole mountainside really is. 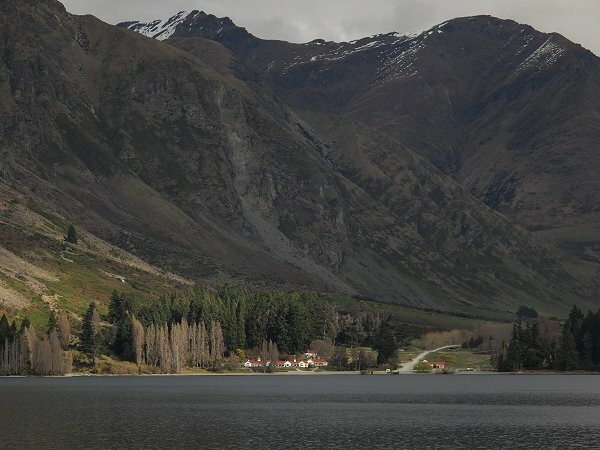 The Walter Peak Station settlement is a pretty place. 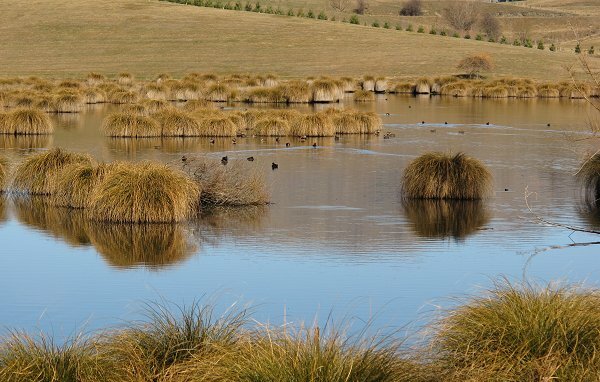 We opted to take the "farm tour", which we suspected would be aimed at foreign and urban visitors, but thought it might be fun to have a look on the other side of the lake. Watching the tourists (what were we?) interacting with the various animals was entertaining. There were red deer, Highland Cattle and Merino sheep which I was interested to see, having never seen one "in the flesh" before. 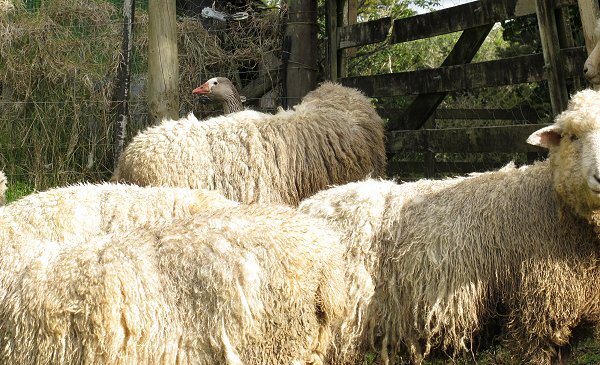 Merino wool is a fabulous fibre! 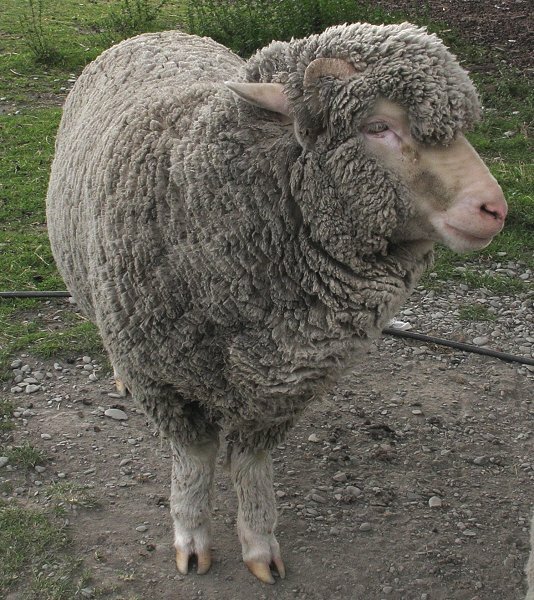 Merino noses are really soft and pink compared with those of our coarse-haired Romney-based animals. 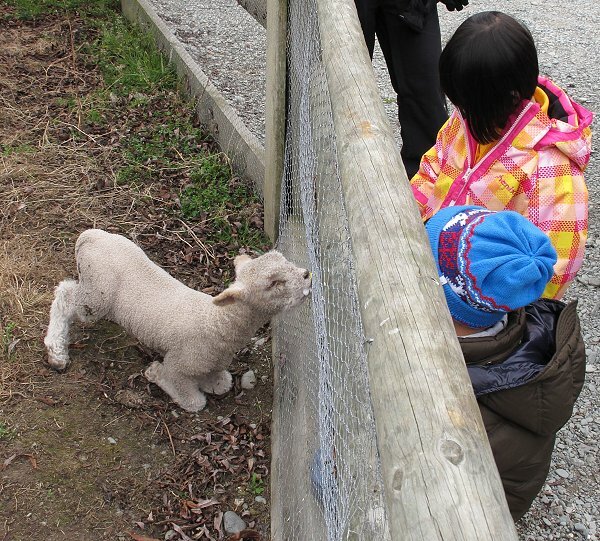 I'm never sure how much value there is for lamb or child in feeding through a wire fence, which prevents any real interaction between them. Hopefully the lamb really lives in somebody's kitchen the rest of the time. I thought we had better take a few pictures of ourselves on holiday, for the record. I strongly suspect this may be an Australasian Crested Grebe. It was a bit far away to see very clearly, having surfaced out in the bay as the Earnslaw was pulling away from the jetty, at the beginning of our return journey. 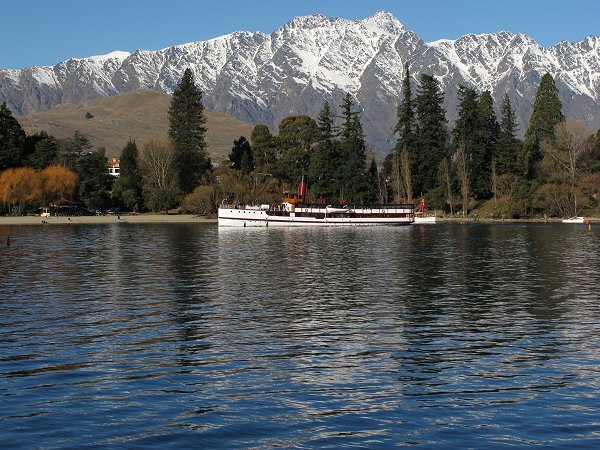 Back on the Queenstown Wharf. Asian tourists appear to spend more time looking through their camera lenses at their holidays than they do really experiencing their surroundings! It's something I try to be aware of when holding my camera: don't only look for photos, look! 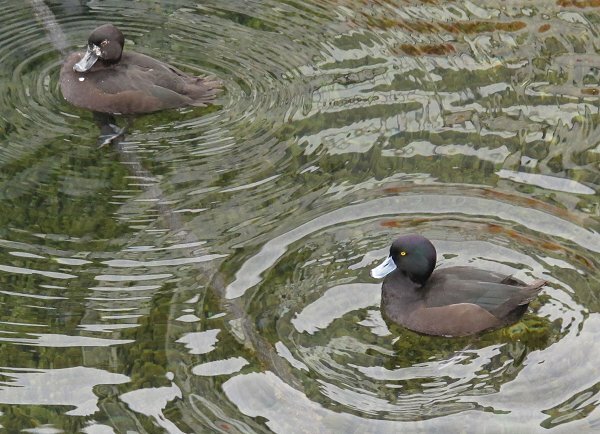 These lovely birds are Scaup. They were noticeably smaller than the numerous Mallards with which they were swimming around in the shallows of the lake and beneath the wharf areas.